This was a high scoring category, making it all the harder for the judges. But after close analysis of the scores and much discussion among the judges, the top two entries came down to Vodafone Procurement Company and Lancashire Teaching Hospitals NHS Trust with Ingenica Solutions. Vodafone regularly achieves high scores in this category and this year was no exception. The entry centred on a streamlined mechanism for small-spend transactions, allowing Vodafone Global Companies worldwide to purchase products and services through one process, one tool and in local languages. From left to right: Nicola Hall, managing director, Ingenica Solutions, Ian Britcliffe, head of supply chain, Lancashire Teaching Hospitals NHS Foundation Trust, Fiona Burton, consultant, Ingenica Solutions, Mike Fletcher, operations manager, Ingenica Solutions, Allan Waller, Chairman at ELUPEG, and host Sara Pascoe. Starting with a small team four years ago, the scale of the project has increased significantly and now covers over 300 categories and a network of 2000 suppliers. The judges liked the clever use of digital dashboards, the cloud and e-sourcing which allowed the team to track and monitor performance on a live, transparent platform, available to the whole team at the same time. Personalised reports enable the team to see whether they are in line with forecasted spend, savings and overall strategy. The cost savings achieved were substantial too, returning a significant percentage to the business. This was an excellent entry and a tough one to beat. However, they were up against very strong competition, so the judges unanimously voted to Highly Commend Vodafone Procurement Company. The entry from Lancashire Teaching Hospitals NHS Trust (LTH) with Ingenica Solutions is an excellent pointer to the direction of change set to transform supply chain practices within the NHS. It is now mandatory for all hospitals to implement GS1 data standards and inventory management and LTH has been making exemplary progress. The Trust has embarked on an initiative to improve procurement and supply chain processes, starting initially with the busiest, most challenging and highest spend areas of the hospital, the operating theatres. By implementing Ingenica Solution’s inventory management solution, Atticus, major savings have been made through greater operational efficiency – from automating ordering, reducing wastage and optimising stock. Importantly, there have been positive outcomes for patent care and safety. The judges were impressed by the Trust’s close collaboration with suppliers and they were pleased to see that the initiative has been rolled out to more than 130 areas within LTH. 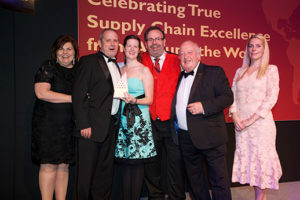 This was a worthy winner – the trophy for sourcing and procurement was duly awarded to Lancashire Teaching Hospitals NHS Trust with Ingenica Solutions.